This Demonstration shows a rectangular or cylindrical container and its particulate contents, such as a cereal, tea leaves, coffee, dried fruit, salt, or spice. It gives the container's external dimensions, contents, and headspace. The input parameters are the content's mass and bulk density, the desired headspace in percent of the container's height, and its width and thickness or diameter. 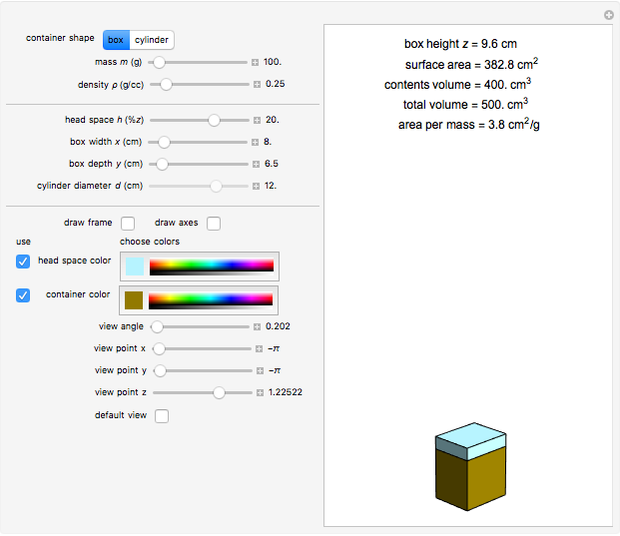 The Demonstration calculates and displays the container's height, its area and total volume, the volume of the contents, and its area per unit contents' mass. 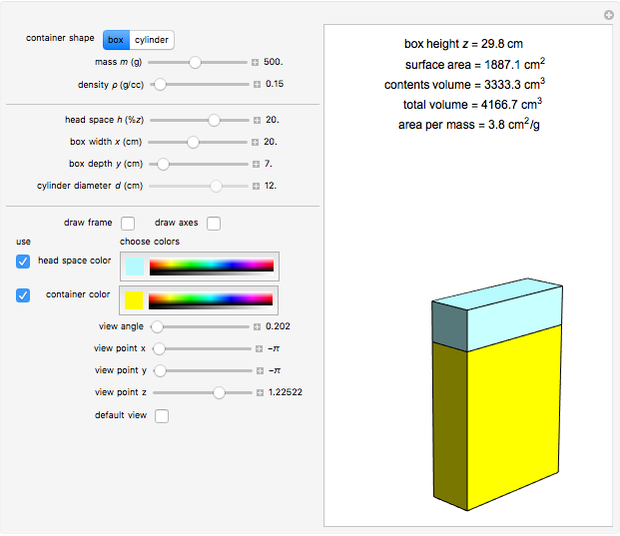 This Demonstration calculates the height, surface area, and volume of a rectangular box or a cylindrical container for dry or semi-dry food particulates. 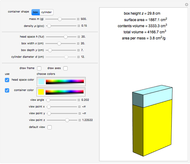 You can enter the content's mass , bulk (apparent) density ρ, percent headspace , the container's width , and thickness (depth) , if rectangular, or its diameter , if cylindrical, all with sliders. 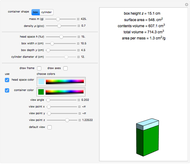 The rectangular box's calculated and displayed height is , where the box's total volume is . The content's volume is . The box's surface area is and the area per unit mass is . In a cylindrical container, the content's volume is again , but its height is . 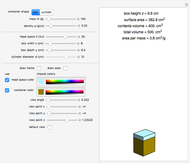 The container's total height is and its total volume is . The container's surface area is and the area per unit mass is . The Demonstration lets you view the displayed rectangular box or cylindrical container from different angles and distances, and present the contents and headspace regions in different colors. Not all the shapes that can be created with the Demonstration have a practical counterpart. Although primarily intended for designers of rectangular and cylindrical food packages, the Demonstration can be used for packages of other particulates, chemicals, pharmaceuticals, or toiletries, for example. With appropriate mass and length units, a similar program can be used in the design of large containers for the transportation or storage of particulates, including fresh agricultural field products. Mark D. Normand and Micha Peleg "Container Filled with Particulates"